This story begins with two young ghosts as they near the entrance to a very haunted looking house at the top of a hill. Eerie lights, slamming doors and even shrunken skulls are just some of the dangers in their way. Will they be brave enough to enter? “Pray, flee now, flee now if you will! The language and illustrations marry up perfectly to create a suitably creepy atmosphere. The use of sepia tones in the illustrations adds to the tension and pulls readers in. The first double spread is just stunning. There are two large, golden-eyed owls peering down from a tree watching as the two ghosts slowly make their way through the night and up the street towards the lone house on the hill. The language definitely has the Gothic style of Edgar Allan Poe which helps build suspense and add so much more to the story. I also love the moths and their somewhat cheeky smiles and a special mention must be made of the raven on the back cover (surely a nod to E A Poe). This highlights the perfect collaboration of the author and illustrator who understand each other. Not always successful with many picture books but this is just wonderful. I love the end pages which create a beginning and an end to the story with all the spookiness trapped inside. Beautifully written, gorgeously illustrated, this book is going to be a hit! This will be a great one to read aloud to children. 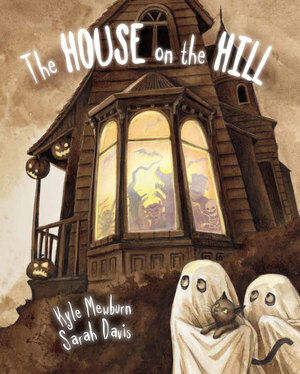 For those that dare – check out Kyle reading The House on the Hill. A warning though, maybe, just maybe, keep the lights on! I confess when watching this clip I actually jumped at one part but you will have to watch it yourself to see if you jump too.